Powell's speech last week at the Economic Club of New York marked the beginning of an official shift. Until then, while the Fed had its dovish dissenters, the consensus was "steady as she goes" with respect to regular rate hikes in the coming quarters. The only uncertainty was whether or not the Fed would hike 2 more times in 2019 before leveling off (maybe it would be 3 times, maybe 1 time...). But seemingly overnight, the consensus is now that we're only likely to see one hike in December, and perhaps NO hikes in 2019. This has been a big adjustment for financial markets. You might think that stocks would enjoy this shift (after all, the news has been eager to tell you that stocks are tanking because of rates), but no... This move was actually led by the longer end of the yield curve--it happened well before Fed rate hike expectations shifted. That mystery rally suggests there's been a huge amount of year-end reallocation out of stocks and into bonds as a general defensive positioning. 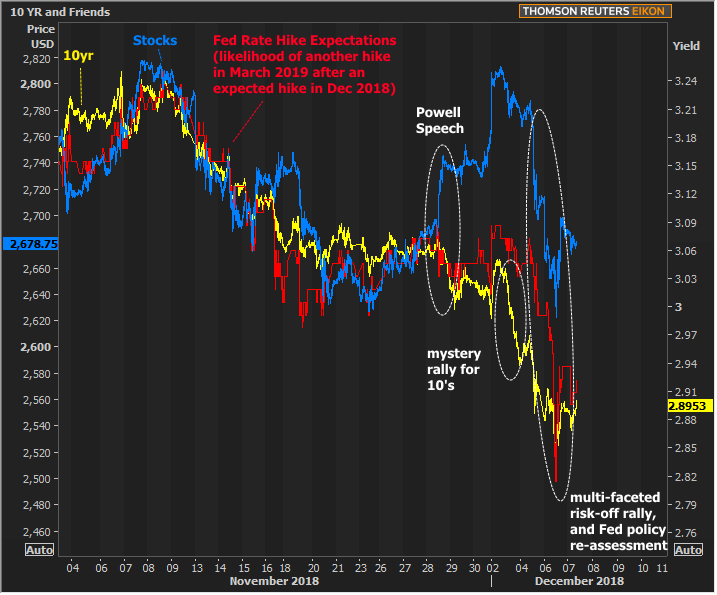 Traders are preparing for the economic realities associated with an absence of Fed hikes. That means there's been some adjustments to be made to stock/bond balances. If today's NFP confirms the underlying motivations for that "risk-off" shift (or if it soundly rejects them), the reaction could be very big.